Representative Honours: Northern Ireland: 14 Full Caps/1 Goal (1962-1965), 3 Amateur Caps (1956-1957); Irish FA Representative (1959); Irish League: 12 Caps (1957-1974). Club Honours: (with Ards) Irish League Champion 1957/58; Irish Cup Winner 1968/69, 1973/74, Runner-Up 1959/60; Gold Cup Winner 1973/74; Ulster Cup Winner 1973/74; Blaxnit “All-Ireland” Cup Winner 1974; (with Coventry) Football League Division Three Champion 1963/64; (with Swansea) Welsh Cup Winner 1965/66. Awards: Ulster Footballer of the Year 1970, 1972; NI Football Writers' Association Player of the Year 1972; Ards Player of the Year 1969/70, 1971/72. * all competitions; # all domestic competitions across all spells. Billy Humphries spent four years at Glentoran, making just a handful of appearances during the disastrous 1954/55 season. 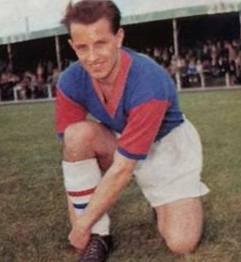 He signed for Ards, against who he had scored on his Glens debut the previous January, in the summer of 1955. Previously with amateur side East Belfast, he made his Ards debut on 24th August 1955 in an Ulster Cup tie with Glenavon. Two years later, under the stewardship of the legendary George Eastham, Ards claimed their first, and to-date only, Irish League title, Humphries playing a key role. Short in stature, he was a prolific goalscorer from the wing and his dashing runs added an extra element to attack. The 1957/58 season also brought Humphries his first major representative honours as he played twice for the Irish League, in a 7-0 defeat by the Scottish League at Ibrox and in a 3-1 win over the League of Ireland at Solitude. Early the following season Humphries was on the end of another Inter-League stuffing, the Scots coming to Windsor Park to win 5-0. He also featured in Ards’ first European match, French champions Stade de Reims coming to Windsor Park and triumphing 4-1 thanks to four goals by that year’s World Cup star, Just Fontaine. Before the second leg in Paris, Humphries had departed Ards to sign for Leeds United in a £5,000 deal - Blackpool had seemed the likely destination until the very last moment. He lasted a little over a year at Elland Road, playing 26 times for the struggling First Division team. Unsettled in England, he returned to Ards in November 1959. It didn’t take long for Humphries to regain his form and in the 1961/62 season he played in all four of the Irish League’s representative matches, most notably in a 6-2 victory over the Italian Semi-Pro League at Windsor Park. 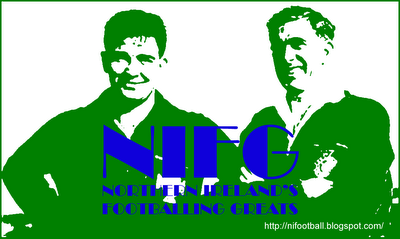 In April 1962 he won his first cap for Northern Ireland, as stand-in for Billy Bingham on the right-wing. It wasn’t a happy match for the Irish – they lost 4-0 to Wales in Cardiff – but it did bring Humphries back to the attentions of a mainland club. A week after the match in Cardiff he was persuaded by Jimmy Hill to sign for Coventry City in a £14,000 transfer, and made his Football League return in a Division Three match against Hull on 28th April. By the end of the season Humphries had won his second cap, and again Northern Ireland lost 4-0, this time to the Dutch at Feyenoord Stadium, Rotterdam. Over the following few seasons, Humphries established himself on the international scene, taking over the number seven shirt from Billy Bingham who moved to the left-wing. In October 1962 he scored in Northern Ireland’s first ever European Nations Cup (now the European Championship) match, a 2-0 win over Poland with Derek Dougan getting the other. As the Northern Ireland forward-line evolved to facilitate new players, Humphries found himself employed at inside-right, with Bingham outside him. Later he would have to make way himself for new talent, the likes of Best, McLaughlin, Dougan, Irvine and Wilson forcing Humphries out of the international reckoning before he was thirty. On the domestic front things were looking up and he was linked with a move to top-flight football. Humphries scored ten times as Coventry won the Third Division title in 1964 under the leadership of Jimmy Hill. Mid-way through the following season he was finally transferred, but to Swansea Town for £14,000. Humphries' departure from Highfield Road offered a young Dave Clements a firstteam place. Immediately popular with the Swans fans, Humphries could do nothing to save the club from relegation from the Second Division in 1965, and by 1967 he found himself playing in the Fourth Division. The highlight of Humphries Swans career was no doubt the 1966 Welsh Cup Final victory over Chester. In June 1968, just turned 32 years of age, Humphries Football League career was ended by his release by Swansea. George Eastham jumped at the chance to bring one of Ards’ all-time favourites back to Castlereagh Park. His first season back in the Irish League brought an Irish Cup win - Distillery were defeated 4-2 in a replayed final at Windsor Park. In 1969 he played in a famous 0-0 draw with Roma at the Oval in the Cup Winners’ Cup. 1970 brought him the title of Ulster Player of the Year, as well as Ards Player of the Year and appointment as Ards player-manager. In 1972 he led the club to a Co. Antrim Shield success and at 35 won both the Ulster Footballer of the Year and Northern Ireland Football Writers’ Player of the Year awards. The pinnacle of Humphries long association with Ards arrived in 1974 when he led them to four trophies - the Irish Cup, Ulster Cup, Gold Cup and Blaxnit Cup – Ards' most successful season in their history. Humphries retired as a player in 1976, just before his fortieth birthday, but continued to serve Ards as manager until 1978, and again from 1980 to 1982. He was also a club director and manager of the social club until dismissed in 1982. Later Humphries had a spell as manager of Ards’ local rivals Bangor from 1983 to 1985, then ran a newsagents until his retirement in 1991. Summary: 14/1. Won 4, Drew 1, Lost 9.